Ivan Veen: The free-wheeling son of an aristocratic family. We see him mature from a schoolboy to an accomplished scholar to a scholar poet. 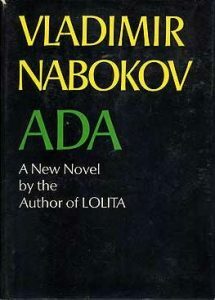 Though he bounces from one lover to another, the one love of his life is Ada. This love lasts for more than 80 years. Through numerous convolutions of family interference and accident, Van eventually finds his way back to Ada. Together they collaborate on their master work of art and philosophy. Adelaida (Ada) Veen: She is Van’s half-sister, although they believe they are cousins. She early expresses an interest and precocious knowledge of botany and entomology. Ada engages in numerous sexual relationships, but she remains firmly in love with Van from childhood on. After a brief time with a film career, Ada eventually finds her way back to Van where they finally live out their lives together. Dementiy (Demon) Veen: A wealthy, womanizing, and unscrupulous man, Demon is the father of both Van and Ada. Demon is married to the mentally ill Marina, but he sires the children with Marina’s sister, Aqua. Demon lives out his life pursuing lovers who become younger as he grows older. His final conquest is a girl of ten. Demon dies in a plane crash. Marina Durmanov Veen: A washed up once beautiful stage and film actress, Marina marries Daniel Veen. However, she engages in an ongoing affair with Demon Veen. As a result, she gives birth to Daniel’s daughter Lucette and Demon’s daughter Ada. She helps maintain the ruse that Ada was born of the marriage of Demon and Aqua. She refuses to believe that Van and Ada are lovers until her final days as she lays dying of cancer. Aqua Durmanov Veen: Marina’s twin sister. Married to Demon Veen and believes she is the mother of Van. She suffers several episodes of mental illness until she commits suicide at the age of forty. Daniel Veen: A dull and crusty but wealthy man, Daniel marries Marina Durmanov and is the father of Lucette. He visits the estate of Ardis and has only the most perfunctory relationship with his family and children.